Eco-Friendly Cleaning offers commercial and residential cleaning with the use of environmentally safe products and practices that are good for you, good for us, and good for the planet. Using harsh chemicals to effectively clean is not necessary anymore. Today there are many alternatives that even outperform yesterday’s hazardous cleaning solutions. Volatile organic compounds, used to enhance the performance of a product, can impair neurological functions, while other chemicals can act as respiratory irritants, carcinogens or reproductive toxins, depending upon the extent of exposure, according to the National Environmental Trust and other environmental groups. We also only use micro-fiber clothes to dust, clean, and mop surfaces. The use of these clothes, compared to standard string mops and paper towels, significantly reduces the use of water and paper. To wash our clothes, we only use green, biodegradable detergent. In addition, we use vacuum packs that emit lower decibels. Their triple filter feature captures most dust particles inside the unit itself rather than broadcasting them into the air. We are committed to providing you with superior green cleaning service. If for any reason you are not satisfied with our work we will come back to make it right. That’s why for over 10 years hundreds of Bay Area businesses and residents have trusted us with their cleaning and janitorial needs. Eco-Friendly Cleaning was started in 2004 by husband and wife team Tsering Gyaltsen, also known as Tsegyal (Sage-gel), and Melanie Hogan. We started this business with the goal of providing superior commercial and residential cleaning service with the use of environmentally friendly products. In the early years, eco-friendly products were not as commonly used as they are today by professional cleaners. This provided us with an advantage, as clients looked to us as an alternative to companies using harsh chemicals. Today we are glad to see that many cleaning companies have switched to eco-friendly products and business practices. We continue to remain competitive with our prices and level of service and are proud of being one of the first cleaning companies to go green. A little about us personally — Tsegyal grew up in a Tibetan Buddhist monastery in Northern India until 1998 when he moved to Northern California. Shortly after he met his wife Melanie. 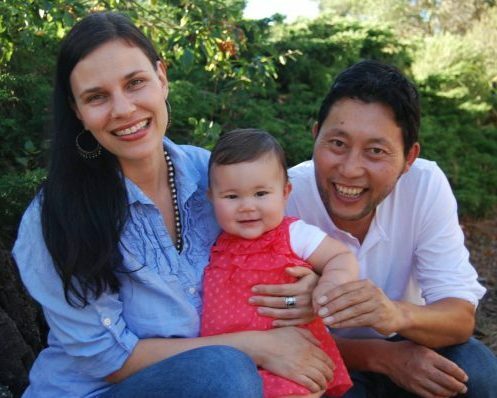 In 2014 their daughter Lhamo was born. Melanie worked in fundraising and marketing and after Lhamo was born decided to stay home with her while working part-time on expanding Eco-Friendly Cleaning. She is the administrative side of the business while Tsegyal is out in the field managing our team, meeting with clients, and doing carpet and tile cleaning. In our free time we love to cook, eat at the great restaurants the Bay Area has to offer and walk the beautiful trails in the Berkeley Marina and surrounding natural areas. The EPA estimates that people spend 90% of their time indoors. Green cleaning supports healthy living that can improve company performance by decreasing illness caused by unsanitary environments and harmful chemicals to clean them.